The Amgueddfa Lechi Cymru (Welsh Slate Museum) is located in Llanberis and as the name suggests it’s a museum about slate… Welsh slate. Given my love of Welsh slate, this place feels like home. And in all honesty, you can’t blame me for feeling at home when I visit because these houses – the quarrymen cottages – were taken from my hometown. 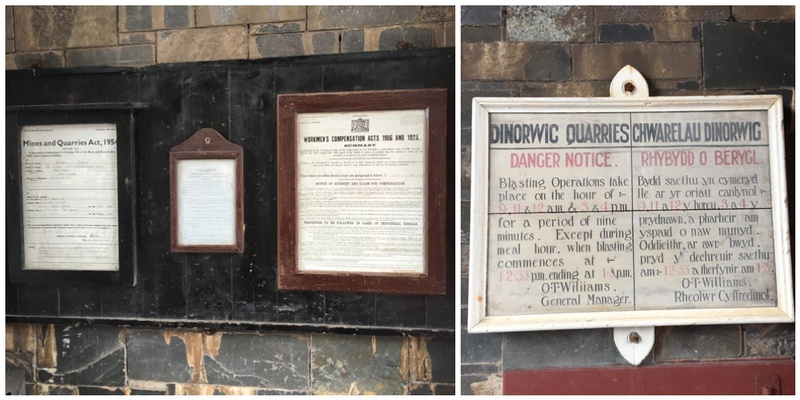 As you walk in through the archway you’re reminded of how dangerous quarries were with framed Danger Notices and copies of the Workmen’s Compensation Acts. In the courtyard that follows, there are a lot of old slateworks items such as trains and carts etc. Being a fan of Thomas the Tank, Little Miss of course absolutely loves the trains! We have a fantastic photo of her stood in one of the “troublesome trucks” (as she called it). Along the sides of the Courtyard there are numerous rooms which hold different exhibitions. One exhibition currently there, is the World War Exhibition which details the impact of the War on Welsh mining communities. In another is an exhibition and video about the life and times of a Welsh quarryman. And in that room there is also a number of aerial photos of the Welsh quarries including a scale model of the Blaenau Ffestiniog area. I stood there looking at it for quite some time and couldn’t quite place what was wrong with it. It was clearly Blaenau but it just wasn’t quite right to me. From there you walk through to another area beyond the courtyard where the cafe, play area and the quarrymen cottages are located. The cafe serves the usual foods and we had a nice soup and an afternoon tea (scone, clotted cream and jam). The children’s playground is also located by the quarrymen cottages. Natural, Little Miss had a go at the slides. She has no fear! Not far from the playground and cafe is the big water wheel. We didn’t go to see that on this occasion but it is fully accessible with a pram or wheelchair (i.e. there’s a lift!). Instead we went to see “The Sound of Slate” installation by Jay Harrison. It was amazing!! Open this image fully to see the description or alternatively, have a peek at the short video that follows. Moving on from here, you walk through old workshops which house a plethora of old tools including a number of these sturdy vices. In another room off the Courtyard you can find one of the little steam engines on display. I’m not sure if this one is used on the railway that goes by the Welsh Slate Museum. As you can see, there is plenty to see at the Welsh Slate Museum. Be sure to keep an eye on their Facebook and Twitter accounts to see about any upcoming events. Unfortunately The Sound of Slate has now finished otherwise I would definitely recommend it. The Museum is open daily from 10am to 5pm (10am to 4pm Nov-Easter) and is FREE entry. I hope I’ve convinced you that you ought to visit the Welsh Slate Museum! I enjoyed our visit and hope to go back soon! Have you ever been to the Welsh Slate Museum? What did you think? I remember going there on our annual school camping trip to Wales. That was a few more years ago than I care to admit and I till remember it vividly. It’s a great day out and really interesting. How great you got to see a row of houses from your hometown there! The sound of slate – love it! In other almost non-related news – this week I learned what the welsh word for microwave was and it had the word ping in it, which I just loved! Fascinating! I think places like this are so important for teaching our children (and us as well) of how things used to be. I’ve been there!! I like the houses. It’s impressive they were taken down brick by brick and assembled again at the museum, I didn’t noticed them or maybe they were outside what was opened to the public when I’ve been there. I love taking mine to museums (especially when they’re free!). Such a fun hands on way to learn.